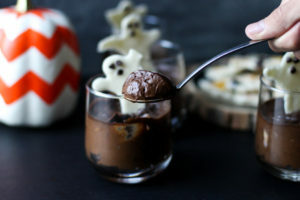 I know, I know, I’m really late to the party, but I’ve come with some super quick and easy dessert that are a chocolate-lovers dream and allergen-free, so nobody is left out! 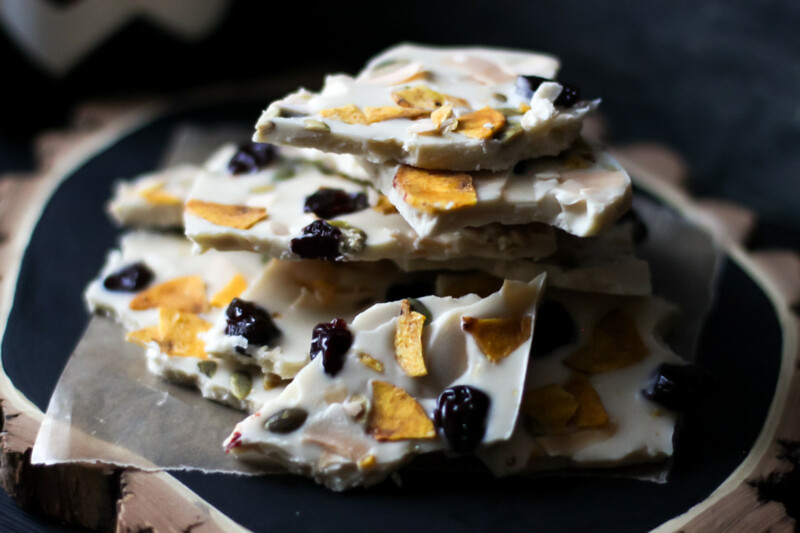 More on the whimsy side rather than the ‘hey it’s Halloween and I’m going all out!’ kind of dessert, but the rich, creamy chocolate will have you forget my lackluster efforts with some white chocolate bark for good measure and to keep this yin-yang in our chocolate universe. 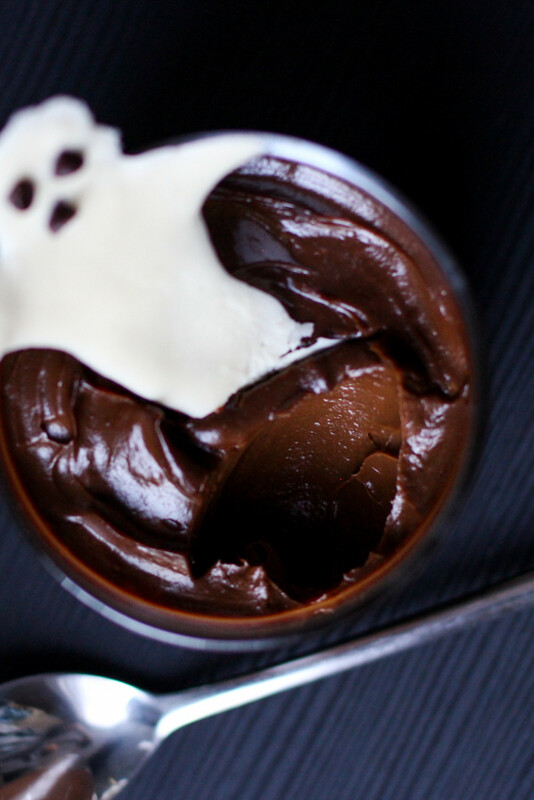 This is chocolate heaven, my friends – Halloween or otherwise. The pot de creme is as creamy and decadent as its’ traditionally made fancy French cousin yet without all the fuss of whisking, custard-making, the eggs … blah blah blah. 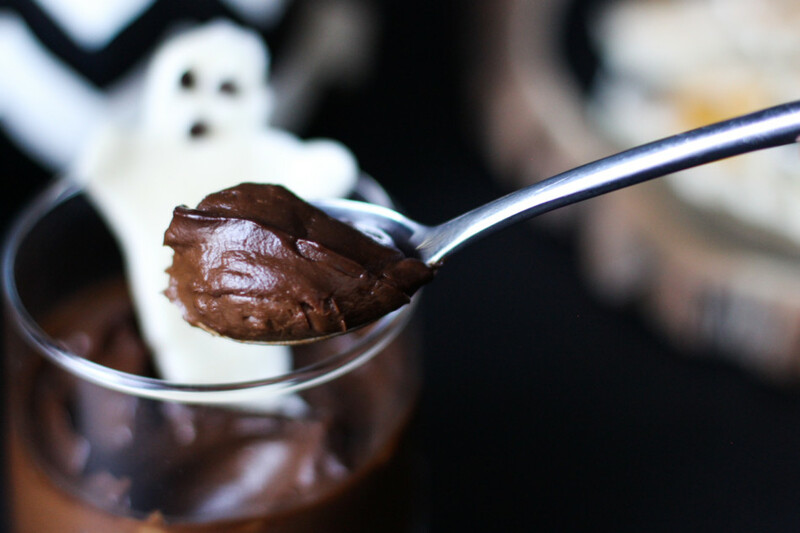 I took the short-cut route using a food processor and not-so-French dessert ingredients to hide a bunch of good fats – my version of a trick and a treat. Given the taste, you won’t miss a darn thing. HEH HEH. 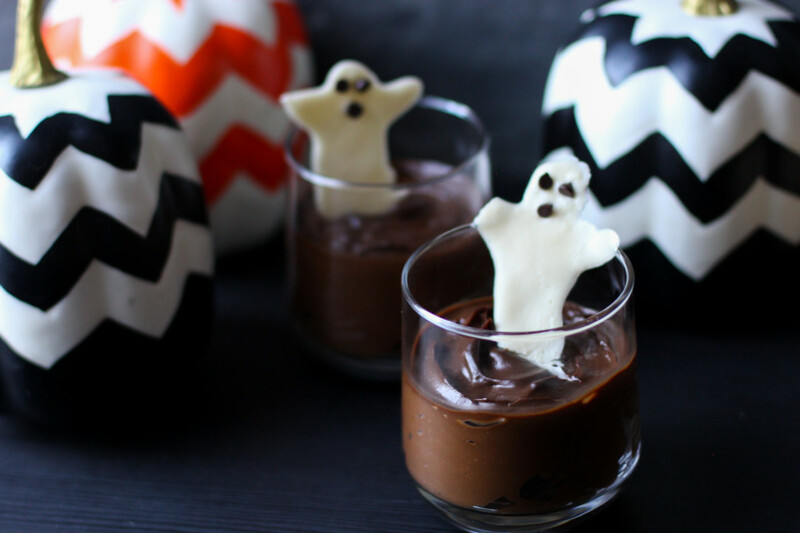 Guilt-free rich and creamy chocolate pot de creme and white chocolate bark for Halloween or any time of the year. All allergen-free, paleo, and vegan - a treat everyone can enjoy! *Prep time includes chilling time. Place peeled and seeded avocados, coconut oil, coconut nectar, maple syrup, vanilla extract, and kosher salt into a food processor. Puree for 2-3 minutes until completely smooth. Meanwhile set a medium saucepan with about 2-inches of water to simmer over medium heat with a glass bowl set over it (be sure the actual water droplets don’t touch the bowl). Add chocolate and 1 teaspoon coconut oil (I noted it separate because I tend to forget to divide the small amount), stir until melted. When melted, take the bowl off the heat and let it cool for 5 minutes before adding to the avocado puree. When ready, add into the food processor and puree for another minute until fully blended. Transfer into serving glasses, cover rims with plastic wrap (not directly on the pudding) then refrigerate for at least an hour. Serve chilled. Can be made a day in advance, any longer will bring out a strong avocado flavor. Can be frozen in a freezer-safe, airtight container for up to a month. Thaw in the refrigerator overnight. 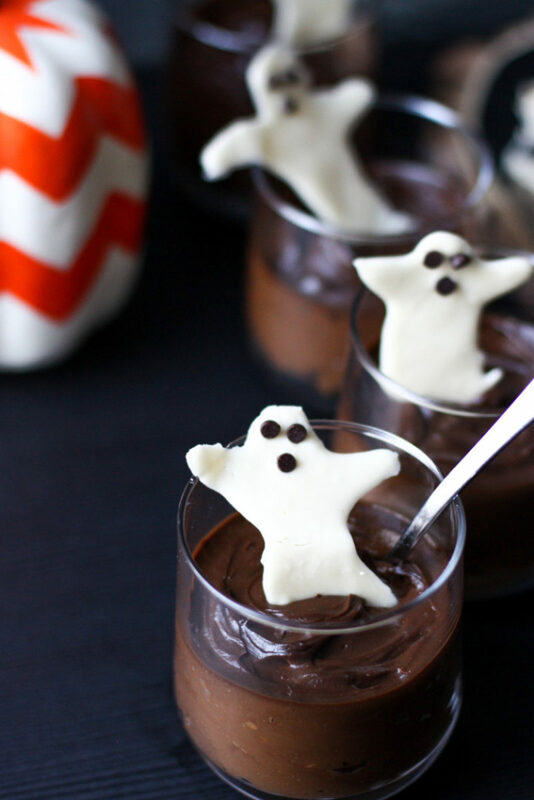 Prepare a parchment, or wax paper lined plate or tray then scoop up a spoonful of melted white chocolate to draw free-form ghosts on the paper. I first made a circle for the head then pushed my spoon side to side for arms then spooned more chocolate to the head and pushed it down for the body. Mine are far from perfect if you like them more precise: pencil ghosts on the other side of the paper then follow the shape with a spoon. Freeze ghosts for at least 10 minutes or up to 2 days. Add eyes and mouth then stick into the pudding to stand upright. Serve immediately. The white chocolate does begin to soften after 15 minutes, so it’s best to add the ghosts just before serving. Prepare the same saucepan filled with 2-inches of water (if it has evaporated, or a double boiler) set over medium heat to simmer with a glass or other heat-safe bowl set over it. Add raw cacao butter and coconut oil to the bowl, stir as it melts until fully melted. Remove bowl from heat and let it cool for 10 minutes before adding sifted confectioner’s sugar, coconut milk powder, and vanilla extract. Whisk to combine until smooth. 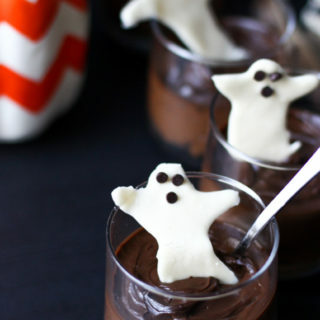 Set aside some white chocolate for ghosts (see how in pudding recipe) and dipping fruit, if using. Pour the white chocolate onto the parchment-lined baking sheet and spread evenly. Spread toppings throughout then chill in the refrigerator for 2 hours or up to 24 hours. Pierce areas with a sharp knife then lift edges to break off sections. Will remain fresh refrigerated in an air-tight container for up to a week. Can be frozen for up to 2 months. This is too cute! I love how easy it is and hell yes for vegan white chocolate...it looks aaaamazing!! Yes, yes, yes!!! Happy halloween as well! Does it really not have any avocado taste? My son hates avocado and is a picky eater but loves anything chocolate. I would love to make this for him. Thanks! Wow both look amazing!! 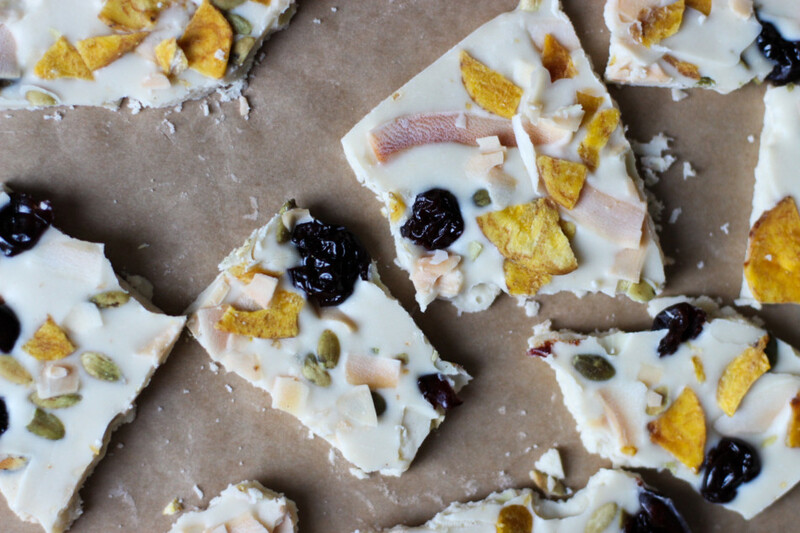 I have been missing white chocolate bark...think this girl is gonna make a big batch of white chocolate bark tomorrow. Which brand of powdered sugar do you use that's paleo? Yayyy it's beautiful!! Happy haloween, Jessica! It's beautiful! He loved it!! It tastes incredible. I can't believe how avocado doesn't come through. Thanks so much for this new recipe! I think I found my new favorite dessert! So rich but surprisingly light with all the avocado and love that it's healthy without ever knowing it. I made it in my blender and halved the recipe in case it had an aftertaste from all the avocado. Now I'm waiting for my avocados to ripen for more in my belly! 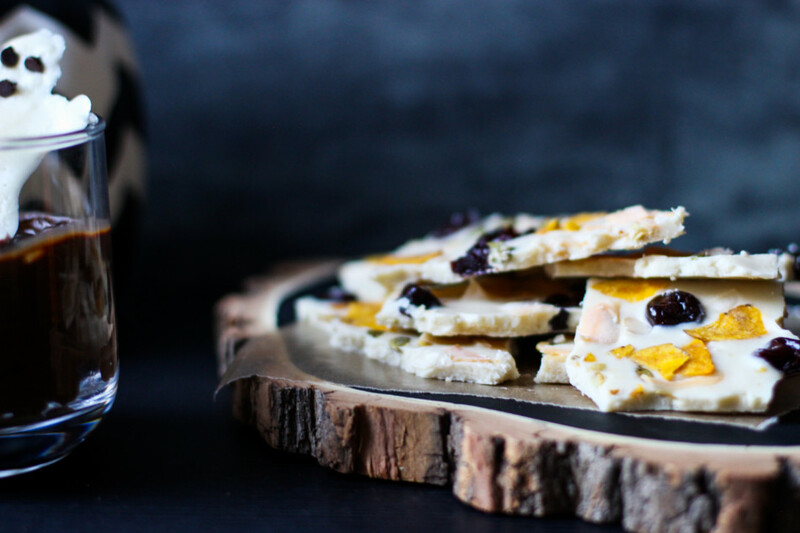 Have you ever tried it with pumpkin? Finally got around to making the bark and holy yum is it amazing!!! 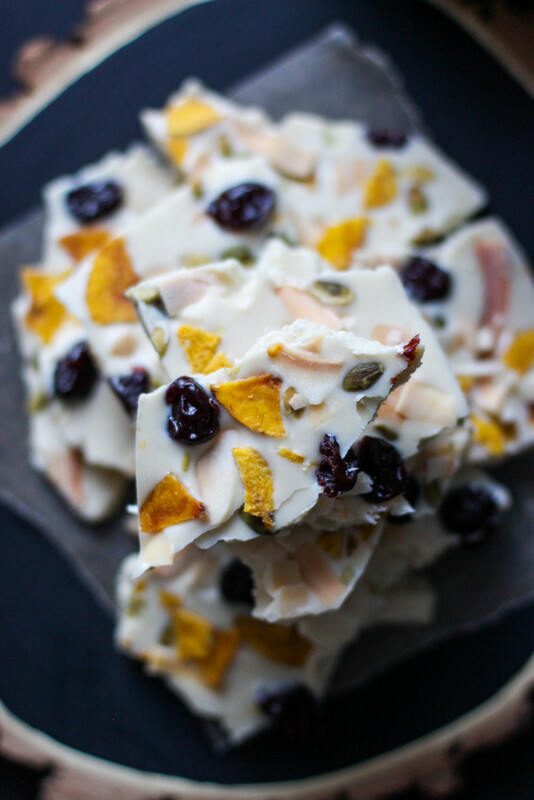 I added dried apricot, pistachio and cherries to mine and had to tell you that my friends thought it was dairy! This was so easy to make and really delicious! I think this will be perfect to make in little cups with strawberries for my daughter's birthday. We are a family without gluten, dairy and soy also. 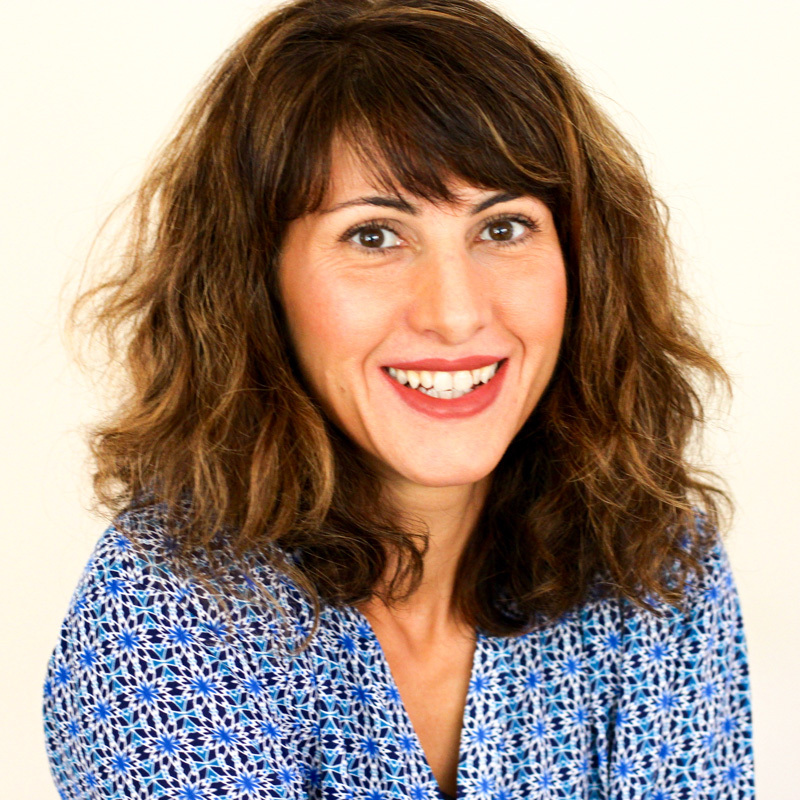 So happy to have come across your blog and look forward to trying more recipes! What a lovely idea, chocolate is always a hit! 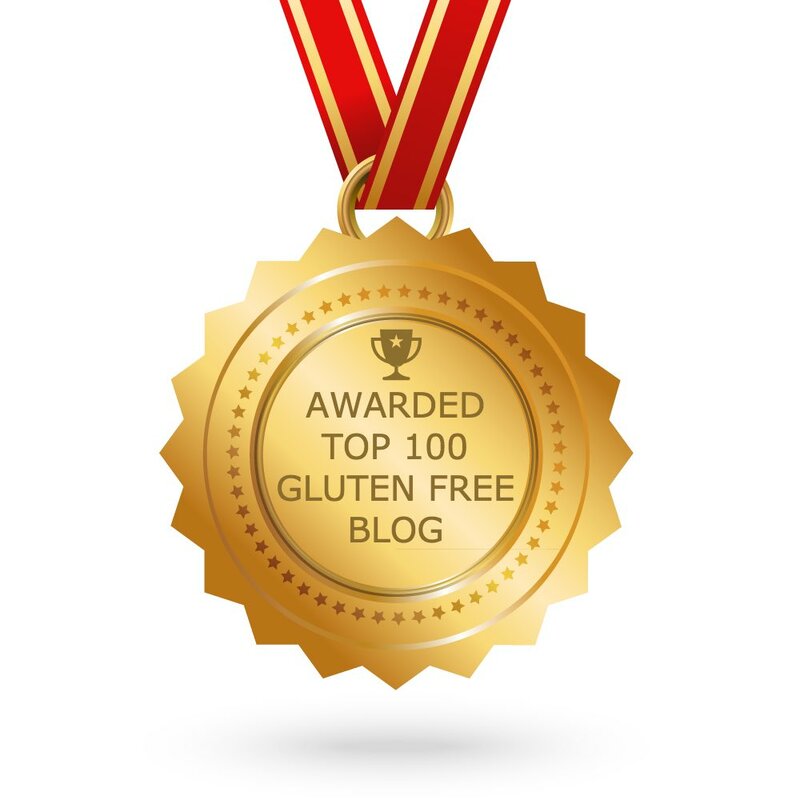 I'm so happy you came across my blog too, hope you find more recipes to enjoy! !